Please join us for our spring lecture, given by Dr. Stephen Batiuk (University of Toronto). 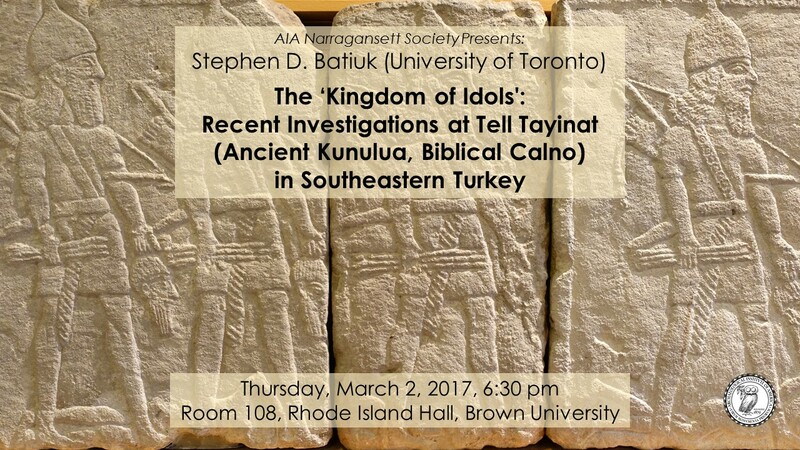 He will present a talk titled “The ‘Kingdom of Idols’: Recent Investigations at Tell Tayinat (Ancient Kunulua, Biblical Calno) in Southeastern Turkey.” See the end of this post for a lecture abstract. This lecture will take place Thursday, March 2, 2017, at 6:30 pm, in Room 108, Rhode Island Hall, Brown University. We hope to see you there! The interplay between the Hebrew Bible and the archaeological record has all too often been a contentious affair, greatly dependent on how one understands its compositional history, as well as the cultural and geopolitical context in which it was written. This talk presents the latest results of the University of Toronto’s excavations at Tell Tayinat, ancient Kunulua (Biblical Calno), located in the North Orontes Valley in the southeastern province of Hatay in modern day Turkey. The lecture will focus on the Iron II-III levels (9th to 7thCentury) at the site, which record the changing fortunes of a Neo-Hittite Kingdom perched on the edge of the Assyrian Empire, and will explore how archaeological evidence from the Northern Levantine Royal city can shed light on the local history of a region, while also providing insight into the cultural environment in which the Biblical texts were written.